Four small scale rock blasts are to be carried out at the site of a notorious hairpin bend on the A9 as part of work to improve the section of road. The blasts at the Berriedale Braes, near Helmsdale, will help contractors to better understand the geology of the area. Transport Scotland said the work will be done between 13:00 and 15:30 on Tuesday 26 February. Traffic control measures will be put in place. Traffic either side of the blasts location will be stopped for a period of up to 10 minutes on four occasions. 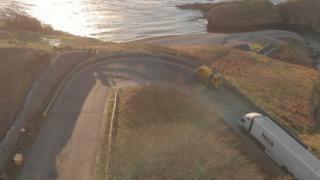 RJ MacLeod Ltd was awarded a £9.6m contract last month to make improvements to a hairpin bend. The A9 drops from a height 150m (492ft) to 20m (65ft) as it enters a valley at the braes, one of the most challenging stretches of the trunk road.